Key Difference: Clouds are generally classified into three types – High, Low and Middle types, depending upon their region of formation. They are further classified according to their shape and size. Clouds are beautiful as they tend to grab the attraction of everyone with their different shapes and sizes. These clouds are formed due to warm air which expands and cools while rising up from the earth’s surface. It continues its expansion and cooling until the temperature of this air and surrounding air becomes the same. This cooling of air brings aerosols and water vapor together and the process is termed as condensation. The water droplets come closer to other droplets which tend to join around the aerosol particles, thus forming clouds. High Clouds – These are the ones which form above 20,000 feet or 6000 meters. These are generally thin and are white colored. However, at times they may also show some other colors due to low position of sun. These are mainly made off ice crystals. Cirrus – These clouds appear feathery and are totally composed of ice crystals. They usually travel from west to east in the sky. They move fastest as wind current is very strong in that zone. They usually indicate a pleasant and fair weather. The streaks can be shaped straight, like a comma or all in a tangled manner. Cirrostratus – These form at the elevation of 18000 feet and above. They too are made of ice crystals due to extremely low temperatures of that zone. They appear like sheet and have a transparent look. They can be recognized by halo phenomena (white or colored rings of light surrounding the moon or sun). 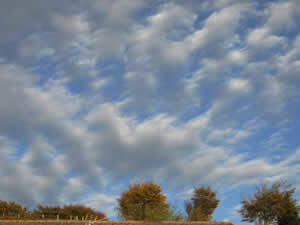 Cirrocumulus –They are the ones which appear in layers infused with small cumuliform unevenness. One can observe them as a collection of many small white clouds known as cloudlets. They appear as ripples. These are not as common as other clouds. Middle Clouds – These are the ones which generally form between 6500 and 20,000 feet. Mainly made of water droplets. Altocumulus Clouds – Their height of base ranges from 2000 to 18000 feet. They appear patchy and in the form of rounded clumps. They may appear white or grey. They may also produce some light showers. They are usually arranged in banks. 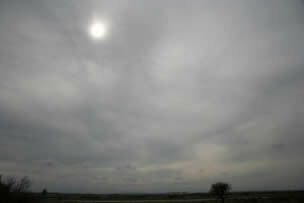 Altostratus Clouds – Their height of base ranges from 7000 to 18000 feet. They appear grey or blue. They are generally opaque and one can see the sun shining through it. They are generally spread evenly. They are usually spread over a very large area. They may appear in stripes or may not exhibit any special feature. The precipitation may be in form of rain or snow. Nimbostratus Clouds – Their height of base varies from 2000 feet to 10,000 feet. They appear dark grey or bluish grey. They are thicker and darker. They may bring heavy rain or snow. They exhibit indistinct outlines. It is known for the production of most non thunderstorm precipitation. Low Clouds – These are the one which have bases below 6500 feet. They are primarily made of water droplets. 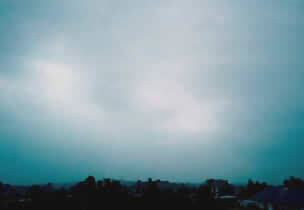 Stratus Clouds – Their height of base varies from 0 to 6500 feet. They are observed as grey layer of patches with ill-defined edges. They are evenly grey. They generally cause results in fine precipitation. They appear flat and have varieties like opacus, translucidus and undulates. Cumulonimbus Clouds – Their height of base varies from 1100 to 6500 feet. These are the heavier and denser ones. These can be described as cauliflower shaped but in a large spread manner. It towers up to 16 km height. It may precipitate in the form of shower or snow. Cumulus Clouds – Their height of base ranges from 1200 to 6500 feet. They are also in shape of a cauliflower but are observed as the separated cauliflower shaped ones. They indicate a pleasant weather. They may also combine to form bigger clouds. They usually have a dark base and a bright top. They precipitate in showers or snow. Stratocumulus Clouds – Their height of base ranges from 1200 to 6500 feet. One may easily find them as series of round white rolls. They precipitate in the form of drizzle. They are dark layered clouds. They are one of the common ones.